View looking north from the upper floors of the West at North Tower. Photo credit Robert Winchester. There has been a lot to follow around the Smokey Hollow area of Glenwood South. The reader-submitted photo above shows another view of all the demolition that has taken place. The “Glenwood Green” area has basically been wiped clean and will be rebuilt over the coming years. 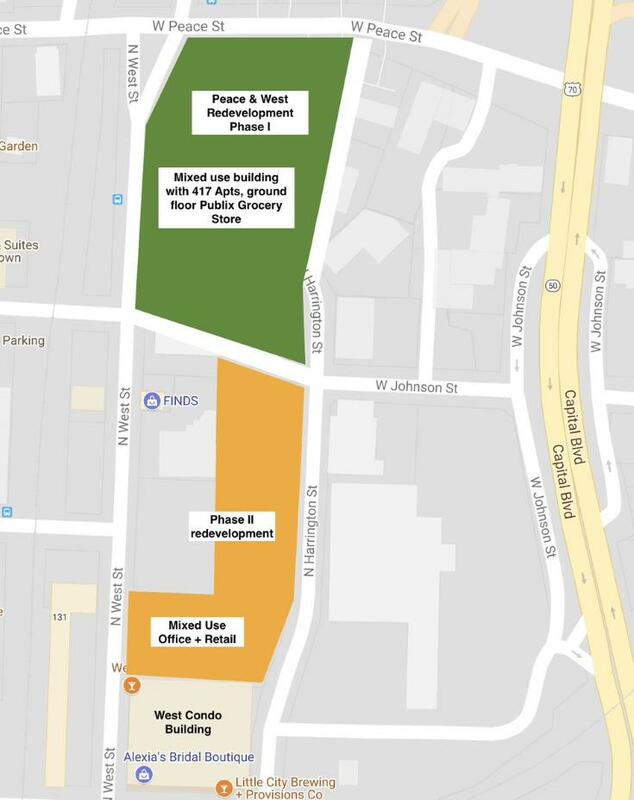 The term Glenwood Green comes from the 2015 downtown Raleigh plan and I thought this a good time to see if the planned developments are in line with what was envisioned for the area. Peace (formerly Smokey Hollow) – 400 unit residential tower with ground-floor retail at the corner of Peace and West Street. A Publix grocery store has been announced so far. Directly to the south, the same developers have bought land for a phase 2 mixed-use project. By the way, the name of the development may have changed from Smokey Hollow to Peace but this blog will always recognize this area and basically any new developments going forward as part of Smokey Hollow. Let’s map it all. I like this one from Raleigh DLA. 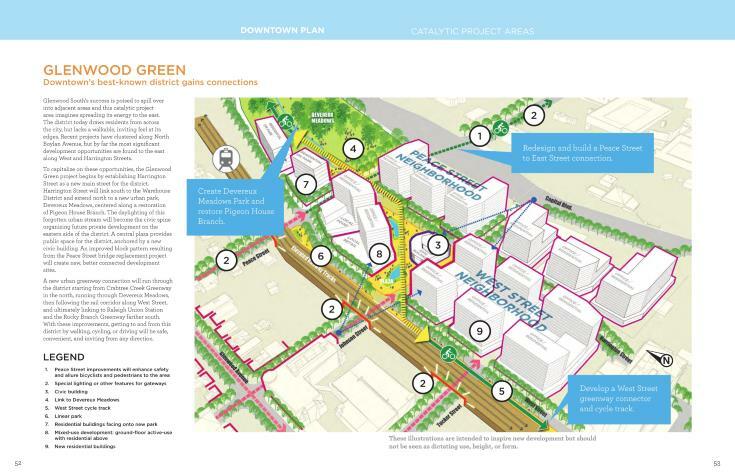 The Glenwood Green vision as part of the 2015 downtown plan so far is coming along. 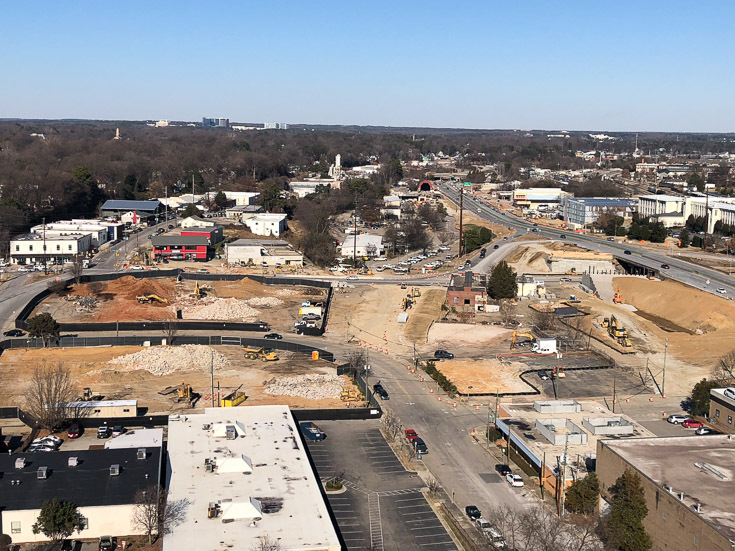 Granted, not much “green” has been planned in this area but once the Capital Boulevard bridge project (the square loop) is finished in 2019, the city can deliver that green with a planned Devereux Meadows Park north of Peace Street. Here’s the two-page overview of the Glenwood Green vision. The vision overview behind Glenwood Green wants Harrington Street to be a new “main street” for the area. This should be where the majority of retail is located and the planning folks have shown us this in their latest update of retails streets in the 2030 Comprehensive Plan. Harrington Street has the opportunity to be the gateway from the Devereux Meadows Park through Smokey Hollow and into the Warehouse District. Notice that Kane Realty has projects at both ends of this street. (All the Smokey Hollow work + The Dillon) Not a coincidence I’m thinking here. What still isn’t being talked about is the idea of a central plaza in Smokey Hollow to really give this area a sense of place. In addition, a greenway or urban cycle track connecting parts north and south would run through this area with this public space being the central hub. The vision in the downtown plan proposes a civic building and plaza but something else could work to make it into a destination. A park could also serve as a meeting place and destination. When you add up the plans for a greenway through Devereux Meadows, the city experimenting with a cycle-track along West Street, and connectivity from the Warehouse District to Dix Park, you can really see how important Smokey Hollow is to north/south connectivity through downtown Raleigh. If you look at the latest map of the Raleigh Greenway system, there’s a core loop around downtown and the surrounding neighborhoods. We still don’t have that middle section that cuts through it. The Glenwood Green vision supports this major connection. 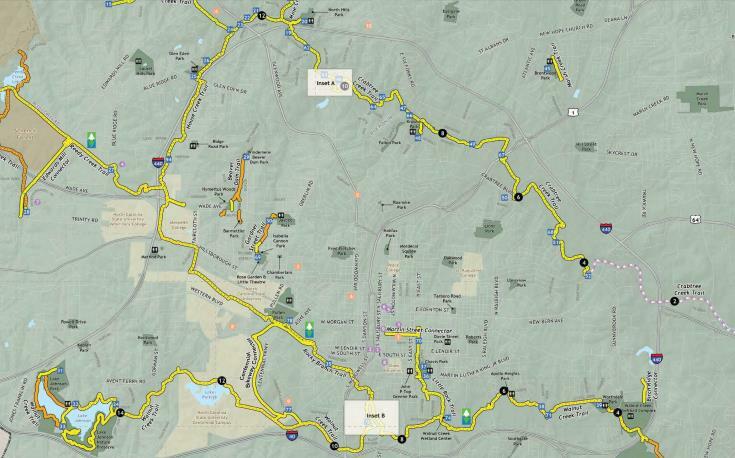 A proposed route from Smokey Hollow to the north towards the current greenway exists. A lot of it would run through Devereux Meadows alongside Capital Boulevard. This was talked about as part of the Capital Boulevard Corridor Study, an effort that took place around 2011. Here’s a map of the proposed greenway route connecting areas north of downtown. Right now, there hasn’t been talk of incorporating that civic space or greenway into Smokey Hollow. Those interested in creating a vibrant area here should keep an eye out because as all this development starts, the opportunities for the connections decrease. If all the land is dedicated to buildings then the idea of a public plaza becomes significantly harder to plan for. The greenway connection may also turn into a glorified sidewalk path rather than something unique. As plans form, I look to the city to work with developers to get this built and see the vision behind Glenwood Green come to full form. I’m not sure if the downtown plan is to be taken literally. Having said that, this entire section of downtown will forever continue to be developed way past this plan, especially if the stadium to the east gets the green light. The free market, who owns the property and what they propose ultimately will determine the final product (feel/look). Hopefully it’s somewhat in-line with what the city is looking for in terms of what makes sense moving forward…economically, vibrancy, and aesthetically. I’m most excited about the street grid being improved. Has Kane confirmed that the plan is to realign Johnson as shown in the photo? @Jenna, The city should not acquiesce to the whims of a developer on issues of city infrastructure. The city owns the street infrastructure, not Kane. @Cliff, The city has a role to play in the development as well. The free market is not a free for all for the developer. If Kane wants to build and profit within the context of a city and leverage its infrastructure to do so, he has to play by the rules of the city. Like my comment to Jenna, the city should not acquiesce to Kane’s whims and hold strong to an outcome that aligns with the city’s vision and downtown plan. The city is not in a position to beg for downtown development. It needs to realize that developers want to be here because it will make money for them. This realization gives the city leverage to push their vision and demand qualities that they seek. @John532 From what I can see on the P5 plan for the area (square loop design), neither DOT nor the city plan to realign Johnson Street. (Here’s the DOT’s plan: https://www.ncdot.gov/projects/CapitalBlvdBridges/download/B5317_B512PublicHearingMapP5_WBase.pdf) I’d love to be wrong and to hear that realigning Johnson has been in the works all along. I’d be equally happy if Kane decided to do it. Does anyone have that info? The city has worked with Kane to get Johnson connected. Yes, it will happen. Thanks, @Leo. Will it be connected as shown in the DLA map so it actually lines up? I would like to see plans for public space in this area pushed forward. I agree, letting more time pass by might mean getting less of what we really want or need in the area. Pigeon House Creek is a major asset in the area. Opportunities to truly highlight it should not be squandered. …so, the city is using its leverage! Good. @John532 I understand that somewhat of a partnership is formed between developer and the city. I just think it’s premature to provide specifics on what will happen in the future based on what is happening now compared to what a GENERAL plan states. What actually happens to that area could turn out better than what’s in the general plan. The only definites we know of is future daylighting of pigeon house creek, future Devereux Meadow Park, future overhaul of Capital blvd (heading into downtown), DOT bridge/road redesign and Smokey Hollow. Hopefully this will help develop that area into the “vibe” the plan calls for. I can imagine a “Glenwood South, Peace Street” exit sign off Capital Boulevard. I do the run club at Raleigh Beer Garden (formerly hosted at Tir Na Nog) every week, and usually park on West St by Southland Ballroom. It’s been amazing to see the changes, and I’m excited to see how it looks in the daylight (the run is at night, and it’s always dark now). These maps and pictures really help me see the massive changes, and how they’re happening. Pretty cool stuff. What exactly is the plan for Pigeon House Creek? Or are there any? Pigeon House Branch runs underneath the Smokey Hollow area, buried in concrete some 15-20 feet down. There was hope for daylighting this portion of the creek as part for the redevelopment, but apparently this required both digging up and re-aligning the creek to conform with Kane’s building plan, and the cost was just too much. My understanding is that the portion of the creek that is partially visible now on the north side of Peace Street will be further day-lighted as it extends north within the new Devereux Meadows Park. @jasdelaney I have walked the entire length of Pigeon House from Peace to Wade, and can confirm, it is already ‘daylighted’ along the whole stretch except where Dortch crosses it. I put that in quotes because it is nowhere near a natural state with C&D waste piled all into it, and little to no buffer. What it needs on just that stretch, is the 50 buffer implemented, and stormwater outlets directed into or through BMPs before hitting the creek. I am really disappointed nobody would even entertain the idea of lifting Peace up about 3-5 feet (it has to dip down those 3-5 feet to meet the culvert top) and running the future Devereux Meadows greenway under Peace, and along the cracked open stream south of Peace to exit at West and connect to the cycleway being put in there. The Smokey Hollow project isn’t sitting on the stream culvert, so I don’t see that any rerouting was necessary to open it up. Even on a tight corridor, just some buffer east of the opened stream and the greenway path on the stream bench on the west side, would have been a huge improvement. Kane cold have had his own San Antonio River Walk. As it is, I don’t think the cracking open idea can never be done now, but the greenway under Peace would have to wait until that culvert wears out in another 50-75 years. Ah, but I see though, either Harrington st itself or the Smokey Hollow parking lot will be sitting on the culvert south of Peace. Future daylighting with buffers and BMP’s almost certainly out of the question. @ Jake , I have just read the council minutes for December 5th Meeting . 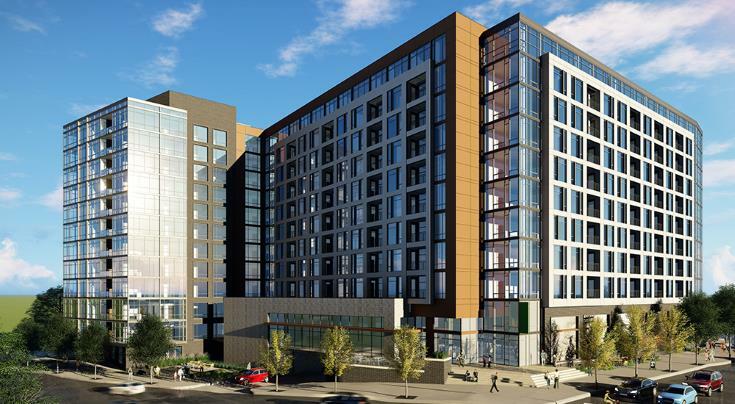 The 12 story rezoning for 404 – 406 S. Dawson St. was approved by council 7 to 1 ! The one vote against the project was Mrs. Mendell , District E ! Mrs. Mendell has also asked council to look at a alternative plan concerning The Central City Complex Project ! Not what I want to hear ! Great news Dwight! Do we have any more info on what is going there exactly, or confirmation they actually are building 12 stories? I know the location seems a little random for a building of that height, but I actually think the contrast with the cool, short buildings nearby will be pretty nice. @Jeff , I have heard that it will be mixed use ,retail , office , & residential on top ! If I am understanding where this is located, just south of Smokey Hollow? If this is the case and Smokey Hollow couldn’t get over 12 stories, please tell me why something a block or so on this side of Smokey Hollow and even farther away from Peace st wouldn’t already be zoned for higher than 12 floors? It’s really far enough away from the Brooklyn Heights neighborhood to not be a concern. The city is just going to make the land that more expensive in the long run and it seems very shortsighted and way to controlling imho! Highly doubtful that the building will be 12 stories. It’s around a 7,500 sqft lot not including setbacks. The elevator shaft, two staircases and utilities conduit/tunnel will take up a large portion of the interior. If I had to guess they rezoned that land to increase the value of the property. This is used by developers to go after funding. Probably looking at 4-5 story max. I have to say that Mrs Mendell has me worried, which is why I didn’t vote for her as I thought she would lean in this direction. I may be wrong but I am under the impression that the city is currently having the City Complex project designed by the firm that designed the 911complex in NY? Also that they are waiting to hear back before bringing any concrete options to the table for review or discussion? Dwight, what have you heard? @ Robert , The only info. that I have heard is that the council will look at the central campus project in the spring ! @Robert, S. Dawson is the SE corner of the Warehouse District. Smokey Hollow has “N.” addresses. With the rise of the Warehouse District this is going to bring some uncomfortable discussions about speed limits on Dawson St. and McDowell St. In the 2 years I’ve lived in DTR I’ve seen 5 accidents (witness two) and maybe 20 times cars racing through Dawson St. at over 60 mph. A pedestrian will eventually get killed soon–get can bet on that. I think that’s an excellent plot to put something 12 stories. It will definitely contrast with the local area and began to fill a major height gap. Driving into downtown from the south you can really see how nicely this will fit. There’s a lot of great places to visit right there in that corner of the warehouse distinct, and there’s a handy dandy R Line stop right there if I’m not mistaken. Whenever that hotel(s?) on the Firestone lot gets built, the urban fabric will begin to become cohesive between Wilmington st. and the Boylan ave. Exciting. Fran, I am so glad somebody else is worried about this. I have seen the aftermath of about 10 accidents that ended up on sidewalks on just Dawson and McDowell. This excludes all the t-bones at intersections. I have engaged both the State and the City (they are State maintained roads) and gotten nowhere. The Borough did put those big planters in front of their patio after a wreck landed on their patio. I have suggested 25 mph speed limits, raised crosswalks, bulb-outs at intersections and bollards at intersections (Campbell installed their own they felt strongly enough about it). The City said they felt my concern but were powerless. I suggested they speak louder. The State staff referred me up the chain where I met silence. Mind you I am also a State of NC civil engineer AND I work for the State (though not DOT) and couldn’t crack the nut. I can’t remember if I brought it up to council (I think I did a few I thought might listen) but maybe folks should raise the issue with them. It will be a horrible day when someone does die because of this, and its definitely a ‘when’ and not an ‘if’. @mark @Fran I echo your concerns here. I have been woken up by several pretty significant wrecks on Dawson right by Nash Square. There was a car crash with fatality on S. Dawson near W. Lenoir St. back in Nov 2016. The driver was doing 70 mph in a 35 mph zone when he lost control killing his passenger. Speed limits alone aren’t enough to slow down some people. @Mark, I like your idea of using raised cross-walks, bulb-outs, and what-not. Maybe if these fools had their shocks driven up through their hood on a raised crosswalk they’d get the message. Do you guys remember that car-pedestrian interaction on Dawson and Lane last fall, where the lady driving the car looked exactly like the lady she hit. That did make me chuckle, I think that they even had the same coat. Raleigh made the cut for Amazon’s HQ2. They announded the top 20 cities this morning. WOOHOO!! Still a long shot IMHO, but the recognition feels good. Out of 238 cities for Amazon HQ2, down to final 20.
push Raleigh to the top of list. Also, Microsoft will be sending out a HQ2 proposal. I think this is amazing we made it to the top 20! Theres a lot of people having to eat crow today. Though i know we still are not at all likely to be picked from that 20, the amount of hate towards the Triangle for thinking we had a shot was ridiculous. @Tony, what is that news you heard? I know Apple also announced they were looking for a 2nd campus but Microsoft is as well? As I’ve said before, “Be careful what you wish for”. I’m thrilled Raleigh made the top 20 … the recognition is great … but I hope we aren’t the last man (or should I say city) standing. Seriously HQ2 is too much. It would change our fair city (and not in a good way) forever. We are already growing fast enough as it is. Charlotte USA didn’t make the cut. They must be green with envy. Raleigh isn’t Mayberry, it’s literally between two of the largest Mega Regions on the East Coast. I heard Wyoming is a lovely place–must be NIMBY paradise. @Fran. I couldn’t agree more, Raleigh is not Mayberry! Raleigh is a large, quickly growing, dynamic place that most residents are proud to call home. I’d like it to stay that way. Pipe dream: twin towers in the two lots north of DECPA! “Prime” corridor from Dorthea Dix to the Ware House District, and up Capital Blvd. I’m assuming this would follow the railroad tracks. I’m all for progress but this is Amazon we’re talking, the behemoth crusher of retail and small businesses. Stealer of young talent needed in other local companies and industries. Reshaper of culture of a town as large as Seattle. This is a big deal, frankly too big of a deal for our region, and definitely too big of a deal for DTR. i hope Raleigh wins the bid, along with 2 500+ foot towers. It would pave the way for more downtown density (office/residential) as well as more large upscale hotels. Builders would no longer pussyfoot around. Go big, Raleigh. Unfortunately I have to spend too much time in Seattle, all the money Amazon brings in does not make a difference in the city and state. They keep raising taxes, massive homeless invasion, rampant open public drug use and abuse everywhere, even in the nice parts, horrible experience for my customers and family members tha I bring along. Affordability is out of control and rises every year. Go live it and not just believe the slick brochure and facts Amazon spits out. Locals are not impressed with them and they all but ignore the negativity that abounds that beautiful area because they have the money to do so. I hope they go elsewhere, the two places don’t have the same culture and in this case Raleigh should not change willingly or unwillingly. Amazon does not deserve Raleigh! I agree that the recognition is good, though I don’t share the petty attitude about Charlotte not getting picked. Obviously the Triangle is a tech center and had a much better chance. Just to be clear, 3 of the areas chosen are actually DC (Northern VA, suburban MD, and DC proper), and two are in metro NYC. The Triangle is in the bottom 4 with regard to population size and the list basically includes the 10 biggest metros that aren’t the Bay Area. Amazon would employ by far the largest number of people (the next largest would be Duke Healthcare at 35K), and we would be remade in its image. Generally I think all the problems we face, like traffic, affordability, etc, would get worse, and all the positives, like a strong university system, strong workforce and good cultural facilities, would get better. So, basically the Triangle on steroids. Whether that’s good or bad is up to personal preference. f you guys want to be entertained for a few minutes, just read the comments section under the “Go Raleigh’ Op-ed the charlotte usa observer wrote. Quite hilarious. people’s heads are exploding in charlotte-gastonia-rock hill MSA. Their insecurity complex is on clear display. Read the Raleigh version of the same article…..crickets. @Dwight – Very glad to hear about the new Empire 12-story re-zoning case! I figured that had to be cleared… no reason not to put something nice and tall in that spot! I, too, am worried about Stef Mendell, and when she says she wants to take another look at the Central City Complex idea, I worry that means she thinks it’s “too ambitious” or “too tall” – BAH! I’m also with those that do NOT want Amazon here. It’s a pipedream, first of all, but second: we are NOT READY for something that big. Nothing really to add, Stew and Steve hit all the right notes on that topic. Amazon has nothing to do with the Seattle homeless problems and the local/state tax increases. That’s bad government run amok. Kind of warped to attribute a private company to those issues. Raleigh would need to worry about traffic, lack of infrastructure, and “Amazon Culture” issues. You missed the point, they bragg about how much money it brings to the community and how things will improve with them in your hood. Kind of like how the EDUCATION lottery was going to pay for education issues yet a fraction of it goes to schools, yet we have had multiple taxation events since the lottery. If a company brings that much money to a community it should not be even more dumpy then when they arrived. Also Dave, “The Company” is people, people impact everything, if you know Amazon, a large portion of that work force “ain’t gonna be from round here” which is fine and all. However, with it brings whatever it brings. Example is we all have friends that moved here from NY to get away from the high taxes and regulation stuff, yet that is exactly what my NY friends are trying to implement here. Just want to make it as sucky as what they ran from in 10 years we will being moving somewhere else because it will be unaffordable. But hey, gotta have that same day delivery man. If this thing comes here (it won’t) and parks itself close to downtown the same thing that happened in Capital Hill ipart Seattle will happen in and around town. Only the people that work at that Place will be able to afford the housing. It will chase the natives out to the woods so they can continue to survive and you are left with badge wearing face in phone zombies wondering around Raleigh with no true connection to how special of a place raleigh is now. Amazon is not good enough for Raleigh! Ship it to for free overnight Charlotte with Prime! The problems some of you assign to Amazon are laughable – It would be good for the city and good for the state. There would be growing pains for sure but it should also push local infrastructure investment. Many of you also act like Amazon has 50K people already employed and ready to ship the moment it would be awarded. This accrual of people would take place over years. Its logistically impossible for it not to (they dont even have 50K working at the current HQ in Seattle). You sound fearful of NC turning into a solid blue state due the invading Amazon hordes. I think your safe for a while. Lol. Thanks Dave. Enjoy your weekend! Sounds like we have differing views of what “good for the city” means…. If we do get hq2 I hope Amazon is prepared to subsidize affordable housing around our already unaffordable downtown. I would happily pay $1000 more in taxes to pay $5000 less in health insurance… and have my healthcare be covered for sure without any runarounds or deductibles. So I don’t see it as “higher taxes”, I see it as an investment. I have mixed feelings about Amazon. It is a lot for our little city to absorb all at once. Part of me wants to see Raleigh grow up and become the big, important city it is destined to be, but part of me is also a bit concerned about the property values, as a renter. Why should downtown be affordable to live in for every income? I just don’t understand that idea. It’s not big enough to be necessary. Live 5 miles away and take a bus if it’s that important to you. I’m still waiting on my “affordable” beach front property. Not every income level, but average income level. We’re quickly running into an environment where the average income level can’t buy property near downtown, not even in it. And this is a separate issue, but I live 3 miles from DT but it would take me 45-50 minutes to take a bus into downtown because there is no bus that crosses 40 over Lake Wheeler. Insane! I’ve already emailed GoRaleigh about it..
Drew so you want property downtown to be analogous to beach front property? Funny, the cultural things that people tout about Raleigh having that make it special usually don’t pay very well – art, music, small business vendors, chefs, etc. Ya’all means Ya’all, not! I will just have to move out to Clayton take ye ole bus back and forth to downtown 5 days a week. No big deal, sure liked when I could walk to work, but that’s for Ya’ll now. Those pay raises can’t keep up with the housing inflation. It was a good 12 year run. I take a Lyft or uber downtown all the time. I live in Garner and it cost me about 7 bucks to get downtown in 10 mins. There are affordable homes in Garner, and within a 7 min drive to downtown. You can still live close and live adorably. Let the market handle it. Sometimes people get priced out. Government intervention in housing is generally a bad idea. Always ripe for abuse. Who gets the cheap housing? DTR’s “problem” is the lack of aging residential units which in older cities tend to provide a little more affordable options. There may be one bathroom, smaller rooms, a dated kitchen, these types of things keep the prices lower. Therefore, with a variety in-between old and new you get an accessible city. DTR only has new, predominantly, which means the market sets a high price. The real question is how can we get lower priced NEW construction? In my opinion, this has to start on the fringes of downtown proper where the land values haven’t shot way up yet. Get that “missing middle” housing built versus more single-family homes and I think we’ll see prices that are fair. Bryan and Dave, agreed, but Amazon landing in DTR would drastically change the market, which is why affordability came up. Let’s not “fix” what’s not broken. From what I’ve read, Raleigh biggest obstacle for landing Amazon is the lack of a mass transit (read rail system). This might actually be an advantage for us. We can tell Amazon that we’ll build our Mass Transit system to fit their needs down the so-called “Prime Corridor” and to the airport. I have to think that the idea of designing the mass transit system to fit their needs would be very enticing to Amazon, rather than having to conform to an already established system. You can count me in the “Pro-Amazon to Raleigh” camp. If people with money want to live in a certain neighborhood, they’re going to drive the costs up, regardless of what housing stock currently exists. Also, as long as supply outstrips demand, the housing prices will continue to go higher, and as long as the local economy stays hot and attracts higher wage workers, housing prices are going to go up. Some things like community land banking might be feasible on less expensive land but downtown and downtown adjacent property is going to be too expensive for that. Not to pile on, but everyone realizes the taxes that would pay to upgrade and expand the infrastructure to support more people in the region that a large employer would bring are waived as incentives to attract these companies? So yes, we’ll get more people with higher salaries and the region will grow, but not the business taxes to pay to grow with them. I obviously mixed up the terms in my last post. As long as the demand outstrips supply (i.e. there isn’t enough housing supply of a certain kind in a certain area) then the costs will go up. But all the new people will be paying taxes: payroll, property, sales, etc. Just saying. I saw ABC11 is reporting the downtown block by the Metropolitan apartments is finally reopening today. And the piece of Harrington that is going away to realign the streets for the Smokey Hollow project is closing permanently tomorrow. And if Amazon comes to town, so too will other businesses that want to be near to or work with Amazon. Those businesses will pay taxes. So, yes, Amazon might get a sweet deal, but in the end, once you consider the growth to the businesses, population, taxable income, the implementation of mass transit, it’s all a net positive. There were certainly be growing pains, but in the end, we would be better with Amazon than without. Seattle residents may like to complain about Amazon, but if Amazon announced it was completely packing up shop and leaving Seattle, they would freak out.